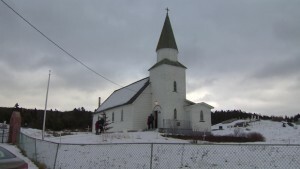 On Jan 6, 2016 St. Matthews Anglican church in Green’s Harbour, along with 3 others – in Whiteway, Cavendish and Hearts Delight – were deconsecrated. These four churches are the canary in the coal mine, as congregations dwindle and these old buildings close. In May of 1874 men of the community met to discuss the need for a proper church and the plans were made to build. 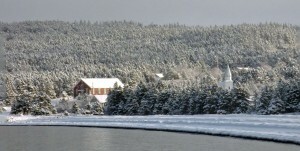 In October of 1880 the bishop came from Harbour Grace and consecrated the building. This quaint little white church has served the congregation well, and has been a landmark for 135 years. GHHS feels we owe it to the memory of all those who have gone before and to those yet to come, to save the face of our community by saving this prominent building. 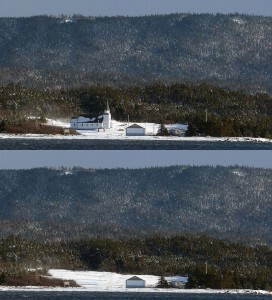 This is what the harbour would look like without the church. 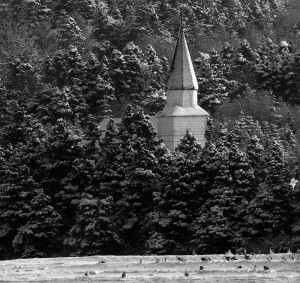 Spire above the trees with gulls on the beach.